America’s TV viewers will be the ultimate beneficiaries of ATSC 3.0, as broadcast television moves to integrate new capabilities and features into the receivers of the future. The new standard will be configurable, scalable, efficient, interoperable, and adaptable. That flexibility is critical as technology continues to evolve. As the chairman of the ATSC’s Technology Group 3, which is assembling the elements of ATSC 3.0, I can see five key advantages for this evolution in technology. People depend on local broadcasters to keep them informed as emergencies develop – particularly with fast-moving weather events. Advanced Emergency Alerting through ATSC 3.0 will allow broadcasters to target alerts, and possibly even “wake” sleeping devices to make sure the public is kept informed of dangerous conditions. 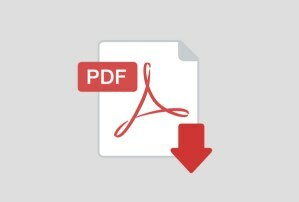 Internet Protocol is the language of the worldwide web, and the move to ATSC 3.0 will allow us to introduce new ways of broadcasting such as hybrid approaches that merge broadcast and broadband. The viewer gets more choices and more diverse content. While we can accommodate up to six channels with ATSC 1.0, the move to “immersive” audio with ATSC 3.0 means that movie viewing and even sports can be more realistic and lifelike. We aren’t limited to stereo left and right speakers. Instead, new systems will deliver a new way of listening to favorite content. Ultra HDTV is here, although there is precious little source content. Ultra HD, and related technologies such as high dynamic range, high frame rate, and wide color gamut, will allow terrestrial broadcasters to continue sending the highest quality signals to viewers. Americans are expected to buy more than 4 million Ultra HDTV sets this year and Hollywood is producing content with millions of pixels. ATSC 3.0 will insure that the highest quality signal is reaching viewers. We’ve had mobile digital TV as an “add-on” capability to 20-year old ATSC 1.0 technology, but it wasn’t baked into the standard from the beginning. People’s viewing habits have changed. Mobile is king. Broadcasters know that they have to be at people’s fingertips in order to be relevant – not just on the big screen in the living room. WOIO-TV General Manager Dominic Mancuso hosts the July AWARN demonstration at Cleveland’s Raycom Media-owned CBS affiliate. 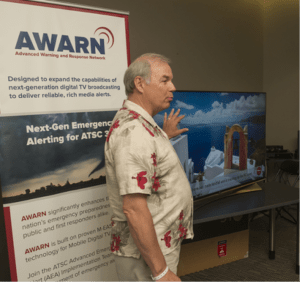 Dozens of expert viewers – visiting Cleveland during July to experience first-hand field testing of enabling technologies for the ATSC 3.0 Candidate Standard – were treated to a special demonstration of AWARN, the Advanced Warning and Response Network. 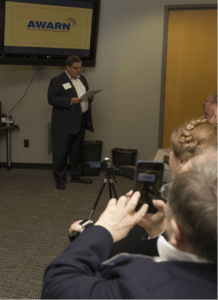 It was hosted by Cleveland CBS affiliate, WOIO-TV, a Raycom-owned member of Pearl TV, in cooperation with Capitol Broadcasting’s WRAL-TV from Raleigh, N.C. The ATSC 3.0 next-generation standard that will improve digital television’s transmission capabilities will make possible important enhancements to one of broadcasting’s most critical benefits – the ability to reach millions of people, all at the same time, with a single transmission. There’s no waiting, no buffering, and no clogged networks. Over-the-air free TV delivers when it counts. Broadcasters throughout the country are saving lives every week – sometimes with weather reports, other times with public safety announcements, news, traffic conditions, and crucial information about disasters or matters of homeland security. 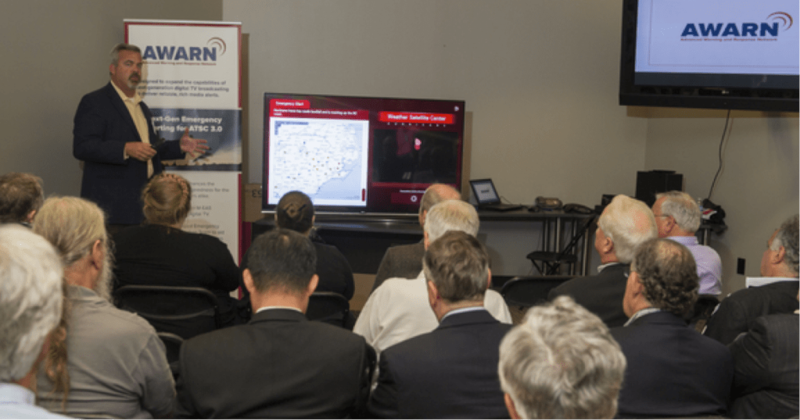 Capitol Broadcasting’s Pete Sockett explains a hurricane use case developed for AWARN by WRAL-TV, Raleigh, N.C. Here in Cleveland, a big concern is snow – and in particular the “lake effect” that can result in snowfall that rivals what Boston went through this winter. Natural and man-made disasters are also a concern. We have two nuclear plants within 100 miles of downtown Cleveland. And even with the waterfront, tornadoes are also a summertime concern. WOIO-TV and the other local broadcasters in Cleveland are vital links to our viewers. While we’re keeping a constant vigil on the skies, our viewers know that they can trust us to have the latest information. And they don’t have to worry about slow Internet service or an overloaded phone network. That’s one thing that won’t change with the transition to ATSC 3.0. From what I understand, the role of local stations will be even more important. Phone networks will continue to experience overload problems, but with ATSC 3.0 AWARN will bring rich media alerts, maps, live video, audio, text, and more to viewers. That will help bring our local stations even closer to the communities they serve. Zenith engineer Tim Laud explains the enabling technologies behind AWARN and the emerging ATSC 3.0 Standard. Dozens of expert viewers – visiting Cleveland during July to experience first-hand field testing of enabling technologies for the ATSC 3.0 Candidate Standard – were treated to a special AWARN demonstration presented by WRAL-TV and hosted by WOIO-TV. by FIONA JAMES, Convergence Services, Inc. Rapid progress toward development of the next-generation television broadcast platform, ATSC 3.0, was on full display on May 13th and 14th at the Ronald Reagan Building in Washington D.C. The Advanced Television Systems Committee’s 2015 Broadcast Television Conference was also the place to hear industry experts offer their insights on the future of broadcast TV. It was clear the future is bright indeed! The AWARN demo alert consisted of an on-screen banner with the option to access rich media. A single click away were video, radar images and maps from a hurricane emergency scenario created by AWARN pioneer WRAL/Raleigh. It was easy to navigate – very user friendly and almost intuitive. Invited members from Federal Emergency Management Agency’s IPAWS team viewed the AWARN demonstration a number of times. They expressed considerable interest in what they saw. “Emergency managers could really get a sense of what is possible in next-gen alerting with this demo,” said one member of the IPAWS team. 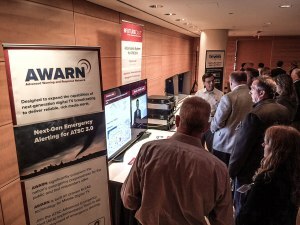 The AWARN demonstration was the centerpiece of the FUTURECASTTM display by LG Electronics, GatesAir, and LG’s Zenith R&D Lab. 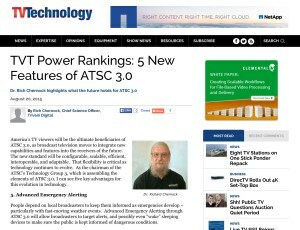 FUTURECAST technologies are being considered for the final suite of ATSC 3.0 standards, which are moving toward candidate standard status expected by the end of 2015. A session on “Business Issues Surrounding the Incentive Auction and the Future of Television” had panelists expressing differing views on the spectrum auction. All agreed that broadcast spectrum is a highly valuable asset. How best to actualize that intrinsic value was the hot topic. Former FCC Chairman Richard Wiley moderated an afternoon panel – “Industry Leadership Roundtable: The Future of Television.” NCTA’s Michael Powel, CEA’s Gary Shapiro and NAB’s Gordon Smith participated in a discussion ranging from retransmission consent to net neutrality and of course ATSC 3.0. Each panelist expressed strong support for ATSC 3.0 and its business potential. 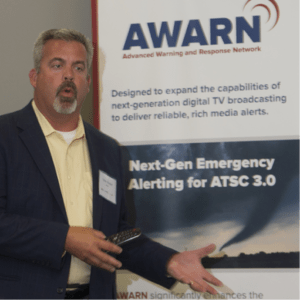 Advanced Emergency Alerts such as AWARN are a core component of ATSC 3.0. This is something that the broadcasters and Capitol Hill can get behind, in part because all emergencies are local in nature. We have already seen strong interest from the FCC, FEMA, and other federal agencies. NAB’s Smith stated, “Localism is the glue that brings communities together. Congress believes in it.” Broadcasters epitomize localism. That’s how they stay relevant, and, as was clear from the conference, ATSC 3.0 is what they must do in order to survive.